At Powershop, the excitement for our partnership with Sydney Gay and Lesbian Mardi Gras is peaking! As we shake our tail feathers in celebration during Fair Day, we welcome our first and beyond fabulous Glambassador and Powershop customer Art Simone! Before the event we sat down with Art Simone to get the goss on all things drag, equality and sustainability. Here’s what our Glambassador had to say. When did you realise that being a queen was a calling? My love for drag can be traced back to my birth, when I was brought into the world with a glitter explosion, sequin diaper and feather boa accessories! What is the best experience you’ve ever had in drag? It changes daily, but at this stage my favourite would have to be being with RuPaul at the opening of RuPaul’s Drag Con NYC 2018. What is your favourite costume to date? My current favourite is my brand new pride dress! It’s dripping in Swarovski crystals and feathers in all the colours of the rainbow! What outfit took so much of your dedication that it almost broke you? The one mentioned above! I spent two weeks gluing over 15,000 crystals individually to the one dress, but every moment was worth it in the end. Although, I do get some PTSD when I see a rogue crystal hidden in my carpet. How did you learn your makeup techniques and can you teach us? I’m a self-taught makeup artist who went to the school of YouTube and hard work. I’ve been doing drag professionally for 10 years, and in that time I’ve had a lot of opportunities to perfect my techniques. Of course I can teach you! I run regular drag makeup workshops throughout the year. I show attendees how to go from drab to fab in just six short hours with 20 layers of foundation, glitter and a dream. It sure does take a lot of makeup and time to make this potato into a gem! How do you think drag impacts understanding and equality in Australia? Drag has always been a fabulous art form for representing the LGBTIQA+ community to a mass audience – I really felt our power and strength during the (Australian Marriage Law) postal survey last year, when we were actively rallying at shows and community events to our audiences. I really tried to push that if you love and support what we do as performers, please support us in this survey. How long does it take for you to get ready before an event? I need around four hours from showering and shaving to walking out the door in full makeup, hair and costume. It’s funny because most people just see me for 30 minutes or less at an event– they don’t realize all the hours of work that have gone into strutting onto that stage! How much does a whole outfit, the phenomenal wigs and make up cost you? Are you at the point of eating ramen noodles every night? For fear of my mother reading this I could never divulge how much some of my costumes and wigs have cost me! I do manage to save a lot of money by making or decorating a lot of pieces myself – plus some of my most prized costumes or headpieces are actually made out of found items that are re-purposed into extravagant fashion! What are your top tips on being environmentally friendly as a queen? Be creative with all materials when you’re constructing costumes, headpieces or sets – one man’s trash is a drag queen’s treasure! Old makeup jars and packaging make wonderful travel-size storage containers for glitters, gems and lashes. Save water and gas by showering with a friend, plus you can pop your drag costumes on a clothes hanger in the bathroom and use the steam to remove any unwanted wrinkles. Heck, just wear one of your wigs while you’re in the shower if it needs a wash too! From watching your stories on Instagram it seems there’s an amazing camaraderie in the drag community. Is it as supportive as it seems from the outside? Oh it is! I’m a strong believer in surrounding yourself with the right kind of individuals who all support and encourage each other. Drag is such an odd and specific career so fellow drag artists are the only people who you can truly 100 per cent relate with. We’re all there to help one another, whether it’s a spare lash or a broken heel – we’ve got each other’s backs! What is your dream for the future of drag – not just for yourself but for society? I’m hoping that as the years go on, we can create more spaces for queens to perform and express themselves. Unfortunately over the last few years we have lost a lot of venues so there is a real need for more stages for drag artists. With that, we could have more working opportunities for queens and hopefully people could start to see the art form as a legitimate career. You’re a Powershop customer, how have you found the experience so far and what do you like about us? Super easy and convenient! It’s also so wonderful that Powershop makes it even easier to be environmentally friendly and to make the right choices! We are big on talking about being green and focusing on renewable energy – plenty of people don’t like that and can throw a lot of shade – how do you deal with shade? Water off a duck’s back! I try not to let shade or negativity bother me, especially when you’re confident and believe in what you’re doing – stay in your lane and reach for the stars! What is at the very top of your dreams list – if you could do or achieve one thing – what would it be? My biggest dream is to be able to share what I do with the whole world. 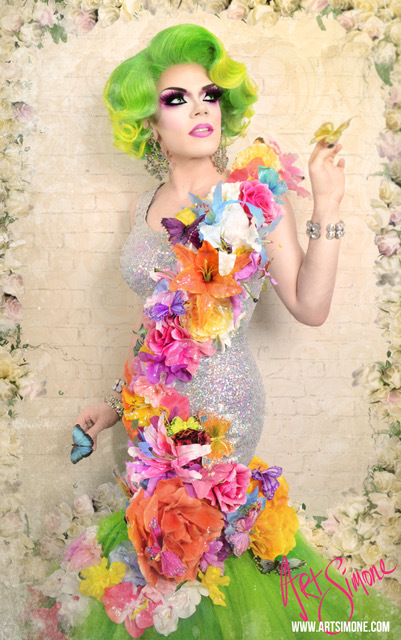 While I’m slowly doing that on my own through the powers of social media, I’d just love to tour and travel more internationally to show what makes Australian drag so unique and special. My favourite song changes hourly! I also destroy my love of some tracks by performing them – but right now as I gear up for Sydney Gay and Lesbian Mardi Gras 2019, I just can’t get enough of anything Kylie! If you’re in Sydney during Fair Day 17 February, come and visit us and Art Simone at the Powershop tent for a photo and a chat. Make a pledge for a safer, greener and more inclusive Mother Earth for your chance to win one of twenty $100 Powershop power discounts. Yass Queen – see you there!